The forest products industry has important interactions with water resources. 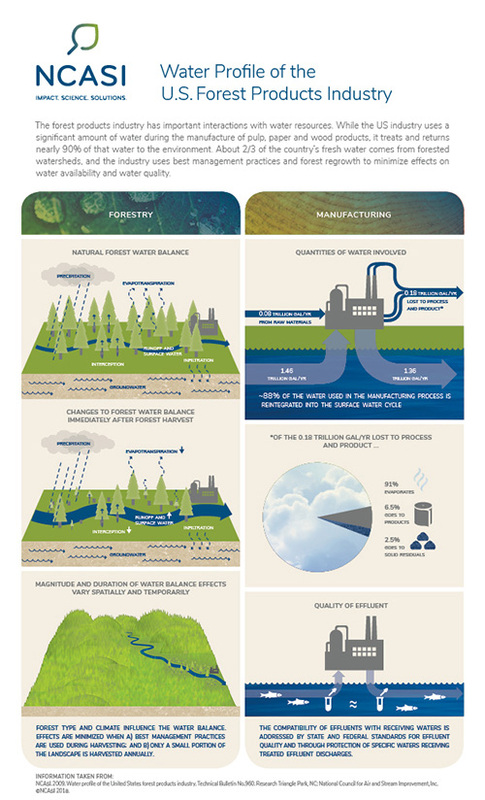 This NCASI infographic illustrates that– while the US industry uses a significant amount of water during the manufacture of pulp, paper and wood products–it treats and returns nearly 90% of that water to the environment. About two-thirds of the country’s fresh water comes from forested watersheds, and the industry uses best management practices and forest regrowth to minimize effects on water availability and water quality. Click on the image to download the infographic as a PDF file. Download high resolution PDF file appropriate for print.